A former Air Force pilot, Martinez is still military personnel but is now the pilot for the Ares 3 mission. His precision as a pilot is noted repeatedly by Watney and other characters throughout the novel. Martinez and his wife Marissa have a young son, David. Late in the novel, the usually-stoic Watney describes Martinez as his best friend. The timeline below shows where the character Major Rick Martinez appears in The Martian. The colored dots and icons indicate which themes are associated with that appearance. Frisella, Emily. "The Martian Characters: Major Rick Martinez." LitCharts. LitCharts LLC, 1 Mar 2017. Web. 18 Apr 2019. Frisella, Emily. "The Martian Characters: Major Rick Martinez." LitCharts LLC, March 1, 2017. 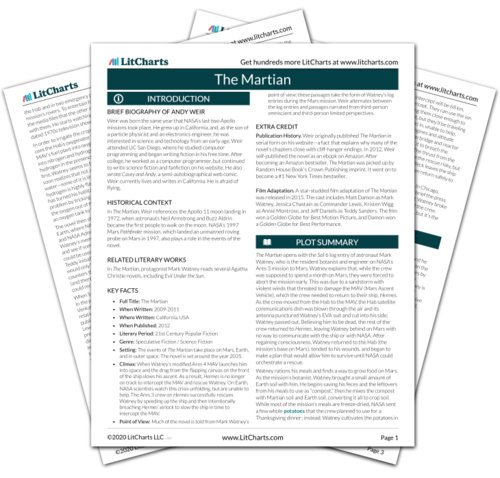 Retrieved April 18, 2019. https://www.litcharts.com/lit/the-martian/characters/major-rick-martinez.